Large organizations produce a significant amount of content in the form of offline and online documents, reports, and letters. To manage this data, it requires too much time and energy; the majority of the employees spend too much time updating their sheets, generating reports, and then waiting for their validation. But SharePoint is a single platform which allows you to manage documents or content with minimum effort. It is a web-based collaboration platform from Microsoft which increases productivity and provides flexibility while ensuring total control. Secure document sharing with your colleagues. Better connectivity with each member of the organization. You can create a workflow for a process from beginning to end. 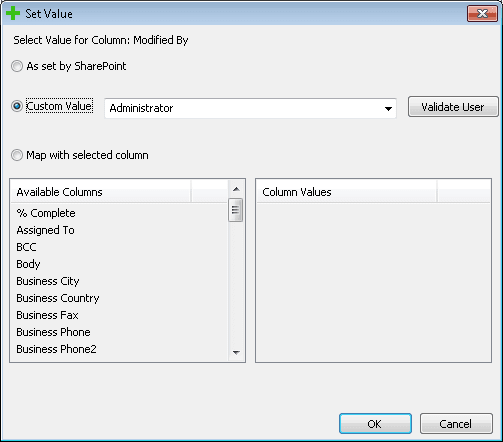 All the components of MS Office are integrated into the SharePoint environment. You can create and publish an external website. When should I migrate Exchange Public Folders to SharePoint? For large organizations, SharePoint can be handy with its features like Advanced search, workflow management, document management, etc. When you want to increase the collaboration in your organizations, you can easily switch to SharePoint. 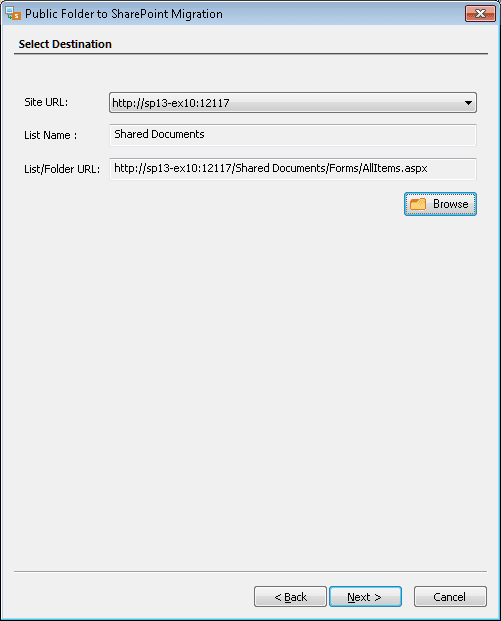 How to move Exchange Public Folders to SharePoint? 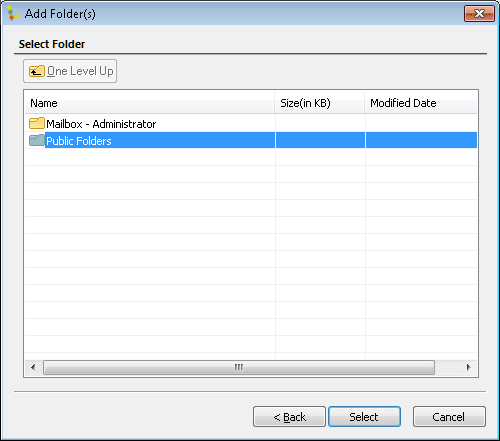 Step – 1: Create a new PST file in Outlook. 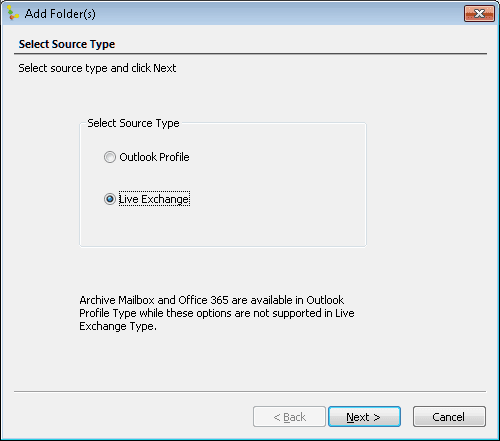 In the Outlook application which is configured with an Exchange account, you should create a new PST file. 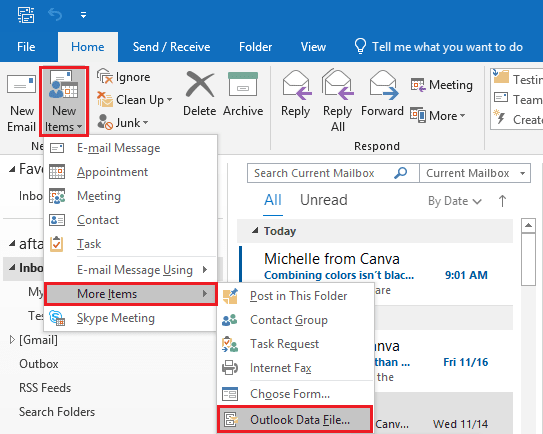 To create a new PST file, follow New Items>>More Items>>Outlook Data File. 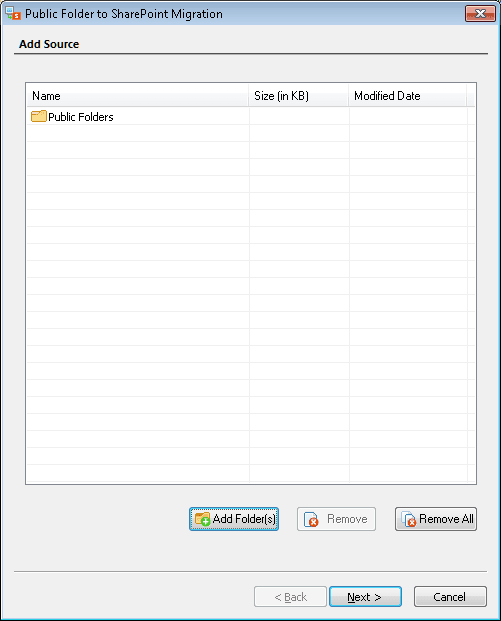 After creating a new PST file, you can manually copy-&-paste data from the public folder to the PST file. You should select only such thing which you want to migrate and leave the rest. The benefit of copying the data from public folders is that if data is lost in the migration process due to any technical error, then you can again access the data from the public folder. After creating the PST file containing files from the public folder, you can transfer the data from PST to your SharePoint account. 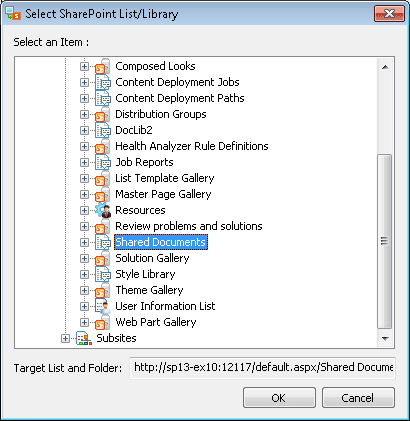 Start by opening the SharePoint in your web browser and go to the respective document library. After accessing the document library, convert the URL of the library to UNC (Universal naming convention). 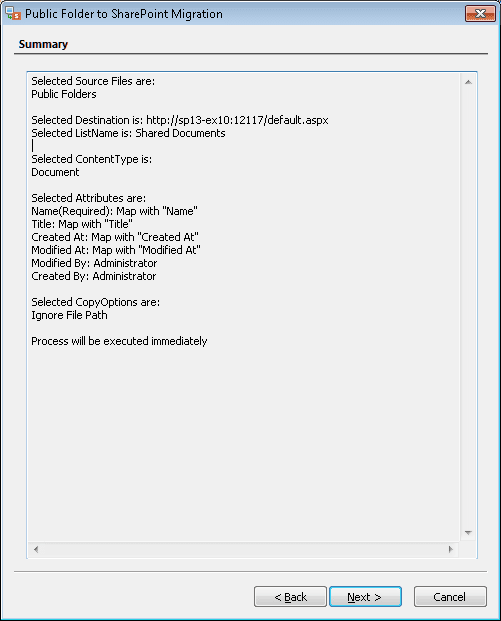 After converting the URL to the UNC format, you can map the drive to the SharePoint. 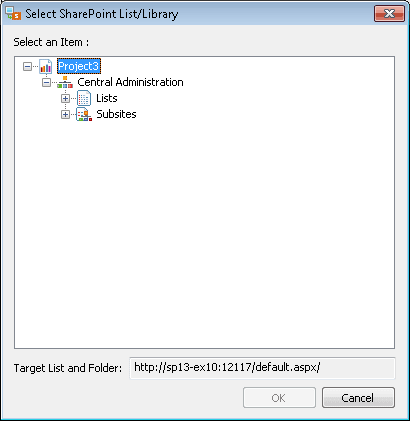 It is done by conducting the drag-&-drop function from PST to SharePoint library. 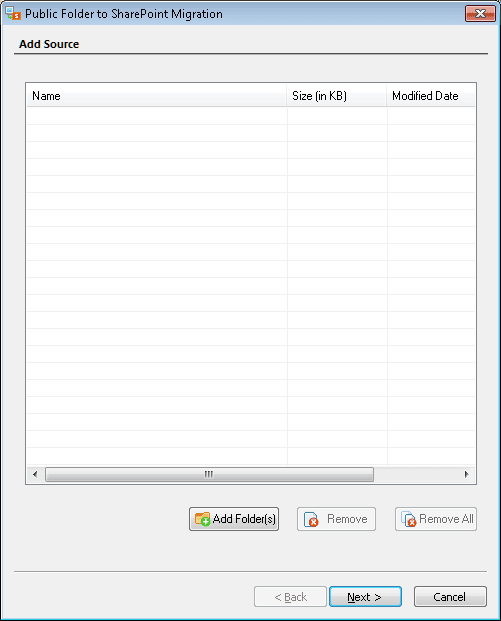 After migration the data, you can refresh the document library, and the data will be present in the list. The above noted manual process may be suitable for data of small size only. But with large data, it will take unnecessary time and energy to complete the process. To save yourself from facing any hardship and to migrate your Exchange Public Folder to SharePoint, use the best SharePoint migration tool known as Kernel Migrator for SharePoint. It can fully migrate your documents and folders and place them neatly at the desired folder in SharePoint. 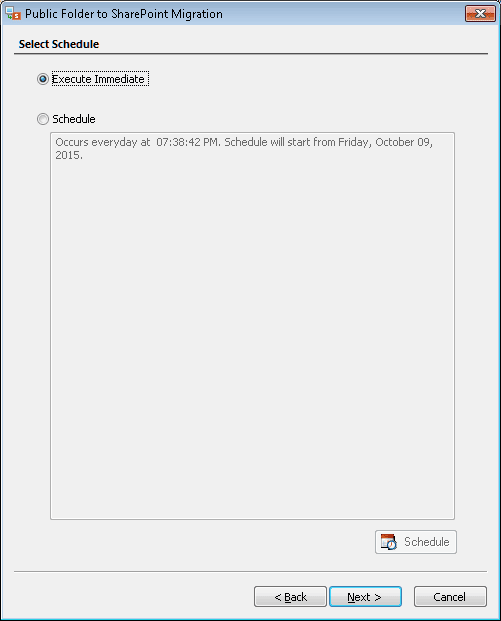 NOTE: You can also select Schedule option and run the migration at a convenient time. Run the software and click the option "Public Folder" menu and select "Public Folder to SharePoint Migration." 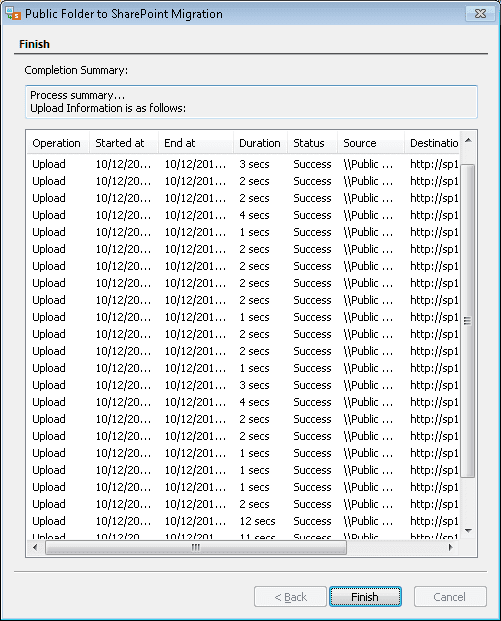 The Public Folder to SharePoint Migration wizard opens up. 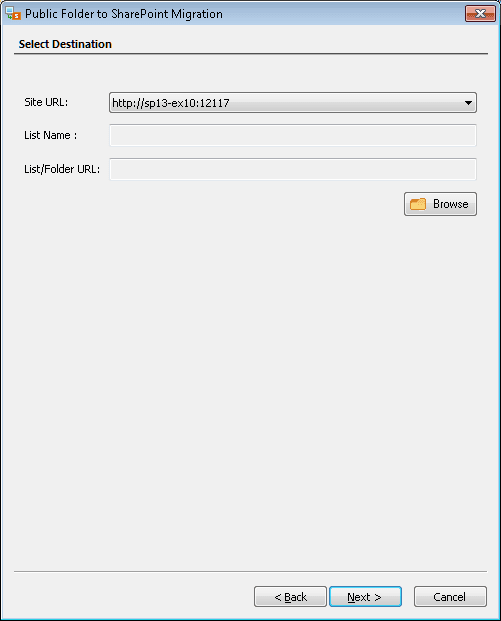 Click Add Folder(s). Select the option "Live Exchange" and click Next. 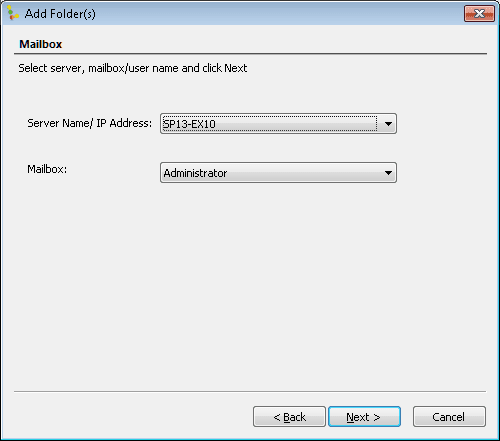 Select the Server Name and then the mailbox name from the list. Select the option "Public Folder” and click “Select." After selecting the public folders, click Next. Click the Browse button to browse the selected SharePoint Site and select a destination list, library, or folder. Expand the List and Libraries to find the desired location. 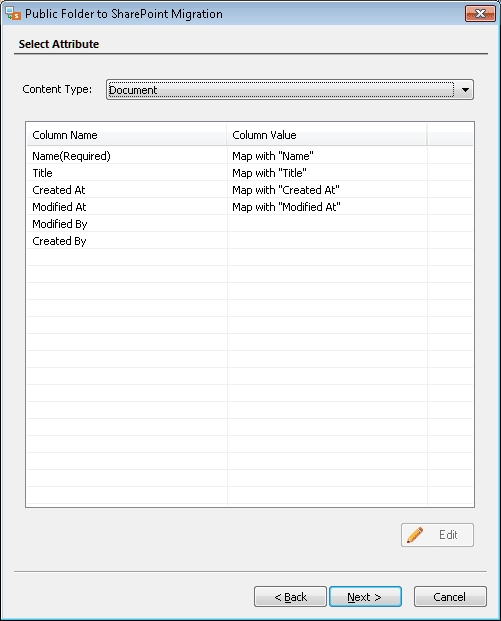 The migrator will first try to map the attributes of the content automatically. It will leave the fields blank if the relevant attribute is not available on the mail. You've to map such blank attributes. Also, you can also modify the already selected attributes. To do this, select the attribute and click Edit. 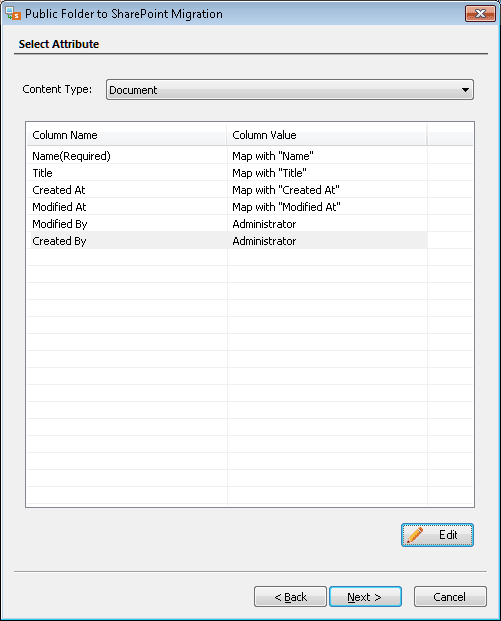 Set the value of an attribute with the desired column. Then Click OK.
After verifying the attribute, the tool will bring to back to the previous content migration wizard, which will display the modified attributes. Click Next. 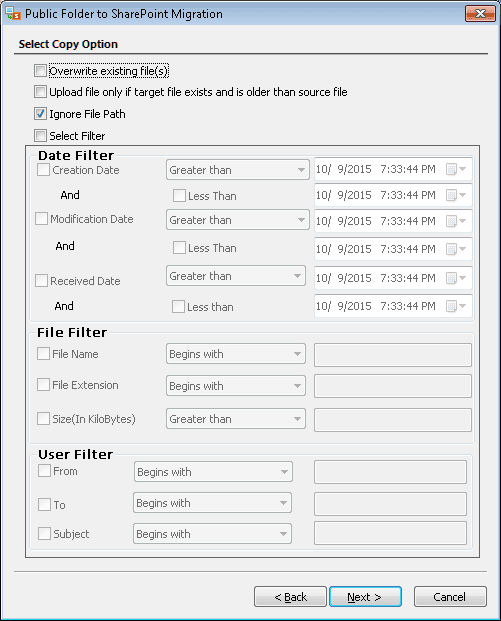 Select the desired Copy Option and filters (among Date, File, and User). The next window will let you migrate SharePoint permissions easily and user groups. Click Next after checking the required option. There are multiple types of permissions in SharePoint environment and you can migrate each of it. 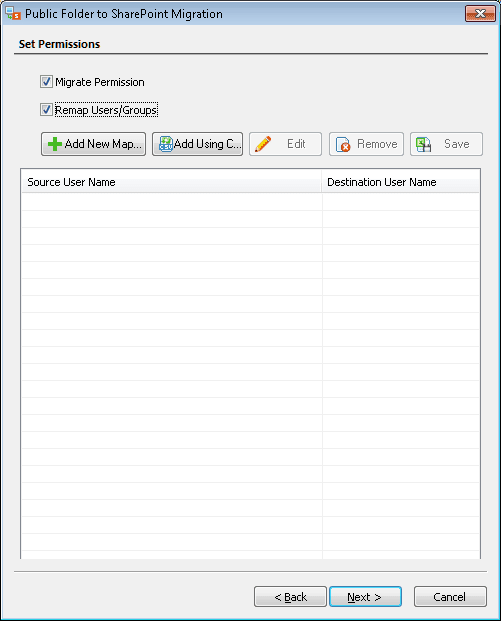 To remap, add the source username and the destination username. The source and destination user named are listed. Click Next. Click "Execute Immediate" option to start the migration instantly. A basic summary of the migration will be displayed to you. Click Next. After a successful migration, the tool will present a migration report with complete information and status of each item. After using both manual and automated methods to move the Exchange public folder to SharePoint, you can easily understand the benefits of Kernel Migrator for SharePoint. It avoids all the complexities and presents you a highly user-friendly interface to assist you in each aspect of the migration. Apart from Exchange public folders, you can use the tool to migrate SharePoint and File System data to the SharePoint.